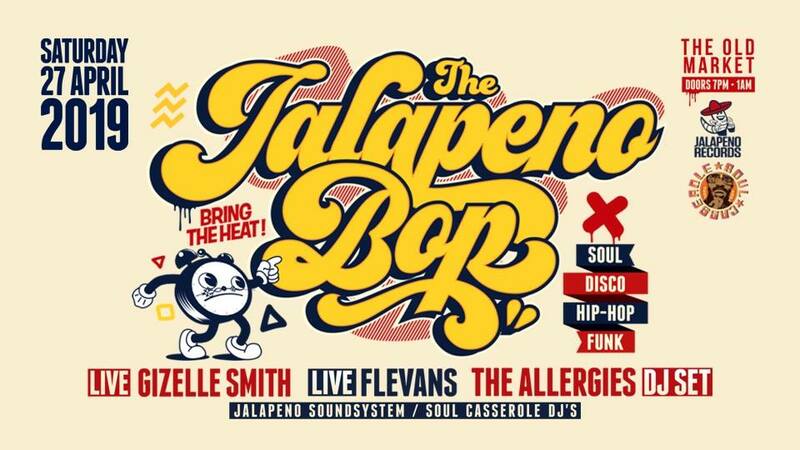 Soul Casserole & Jalapeno Records presents THE JALAPENO BOP with Gizelle Smith, Flevans and The Allergies! Things are heating up at The Old Market, as The Jalapeno Bop returns with its spring session, on a mission to bring quality live soul, funk and disco to Brighton alongside some of the hottest DJ’s around. Three events deep and the night is already becoming a must-see in every discerning gig-goers diary with the event typically selling out in advance. This edition’s headliner is none other than - Gizelle Smith. A performer who exploded on to the scene a few years back with her worldwide smash single ‘Working Woman’ which sold out vinyl runs and hit streaming numbers in the millions as she fronted ‘The Mighty Mocambos’. Since then she’s gone from strength to strength with last year’s album ‘Ruthless Day’ winning support across BBC radio, DJ Mag, Mixmag, CLASH and many more. Gizelle’s shows are truly explosive and she’ll be bringing her full live 8-piece band with her to back up that golden voice and lay down some serious grooves. But that’s not all – completing the lineup is the latest Jalapeno records signing, Tru Thoughts alumnus and all-round local legend – Flevans. He’ll be getting the party started as he debuts his live band fronted by Laura Vane (MJ Cole, Ceelo Green) to showcase material from his new album ‘Part Time Millionaire’. After the live shows we have BBC 6Music favourites and two-time ‘Album of The Day’ award winners – The Allergies back to supply the dancing fuel with a DJ set to take you through to the small hours. These guys are masters at getting people to shake their stuff and have graced stages across the world. Finally, the Soul Casserole DJs will bring the funk flavours in between, on a mission to create a vibe that makes you want to get on the dancefloor and ready for the main event. Hold on to your sombreros people, this is going to be another HOT one.